On March 21, 2007 Democracy Now's Amy Goodman gave the following short report at the start of this trusted, alternative news hour. At first listen it would easily slip into your brain unhindered and get swallowed whole without a single thought. But in this true crisis of truth in media, as painful as it is to face, we have to swallow the bitter pill of reality. Even our trusted non-corporate media is not always what it appears to be. It's left gatekeeping. A controlled opposition. A way to keep the other side from ever achieving any significant success, and to keep them from hindering those in control in any meaningful way. And in this case it's been used for blatant shilling to push a government agenda, pushed sweetly down your throat without a struggle because of who is pushing it. Here's the little report Amy gave today. "Former Vice President Al Gore is heading to Capitol Hill today to testify before a pair of house and senate committees about global warming. Meanwhile, grass roots groups around the country are taking up the issue of global warming. Hundreds of environmentalists rallied in front of the capital Tuesday for the first ever climate crisis action day. In Massachusetts activists are walking across the state this week to raise awareness about global warming. In New Hampshire over 134 cities and towns have passed resolutions asking the federal government to address climate change and to develop research initiatives to create innovative energy technologies. And planning is underway for the first national day of climate action on April 14th. 950 events and rallies are already scheduled. Organizers are predicting that April 14th will be the country's largest grass roots environmental protest since Earth Day 1970." Like wow, right? It sounds like this global warming thing is for real! Go environment! Happy happy, joy joy. Except... on just a little teeny closer bit of examination it doesn't hold up. Come with me while I pick it apart and see what you think for yourself. Sentence One: This is the kicker, and the reason for the whole rest of the story. "Former Vice President Al Gore is heading to capitol hill today to testify before a pair of house and senate committees about global warming." You don't say. Why? Is he testifying under oath? Has he been called to give this testimony? Who's idea was this? Which committees will he be addressing? What are they trying to determine? Just what exactly is this about? Who is trying to achieve what? What? No details? Oh shoot. Shucky darns. What's next? "Meanwhile, grass roots groups around the country are taking up the issue of global warming." Yeah? Nifty noodles. Which grass roots groups? Who are they? How do you know about them? Did they all contact you last night from all over the country to give you that one sentence update? "Yeah Amy, we're taking up the issue of global warming. Okay? Just wanted to let you know! 'K, bye." Where are they? How many are there? What is it they're doing in their "taking up" of these issues? "Hundreds of environmentalists rallied in front of the capital Tuesday for the first ever climate crisis action day." Ooh, HUNDREDS of environmentalists! Hundreds! Environmentalists people! Not just your average Joe! They have titles, they are Environmentalists. What is an environmentalist anyway? What do they do exactly? How did they all manage to get together on a Tuesday, in the middle of the week, not on the weekend when real grass roots activists do their thing? Well obviously they are a higher class of grass roots, they're not just activists or protesters, they're "Environmentalists", there to promote "Climate Crisis Action Day", whatever that is. Not a very grass roots sounding name is it? I'm surprised it's not "Operation Climate Crisis Action Day." It's just kind of that obvious isn't it. "In Massachusetts activists are walking across the state this week to raise awareness about global warming." They are? What activists? How many? Where exactly are they? Where are they starting, where are they ending, which direction are they heading in, generally? Is this a daily thing for the whole week? Can they make it across the whole state in a single week? What else are they doing besides walking? Who's involved? Who's paying for it? How do you know about this? Who contacted you with this "information"? What?? No details? Again??? Geez this is getting ridiculous. But there's more. Maybe the details are being saved for later, huh? "In New Hampshire over 134 cities and towns have passed resolutions asking the federal government to address climate change and to develop research initiatives to create innovative energy technologies." Jeepers, that's like, three states isn't it? Wow, like, is everybody involved with this but ME? I feel so stupid! 134 separate cities and towns, all of them, simultaneously, of their own accord, and no cheating either, they all came up with RESOLUTIONS. Yes they did! Isn't that something? And they all got down on their knees and respectfully asked, requested, very politely, that the federal government PLEASE OH PLEASE PLEASE! address the climate change, pretty please you government guys. And most of all, please please PLEASE tax us so that you can do some very important RESEARCH into "creative innovative energy technologies", and darn it, that's just the way we grass roots types talk. We do too! We always sound like corporate shills! Really! I wonder why none of them mentioned how the DOD always snags all of the new alternative energy patents as soon as they're filed and slaps a gag order on the inventors and then throws the brilliant new alternative energy ideas into a deep dark dungeon so that Exxon and those people can retain their global wealth sucking monopoly on the world's energy needs? Because I just think stopping that crap would have to help. And it would cut down a lot on "research" funding too. But that's just me. "And planning is underway for the first National Day of Climate Action on April 14th. 950 events and rallies are already scheduled. Organizers are predicting that April 14th will be the country's largest grass roots environmental protest since Earth Day 1970." Wowee! That's HUGE! Well gee whiz, April 14th? The day before tax day? That's only three weeks from now isn't it? Kind of short notice don't you think? That's cutting it awful close for the kind of word-of-mouth information sharing that us grass roots types are stuck with. We usually don't get any big media attention when we need to rally the whole country to join us. It takes at least six months advance notice to be able to reach enough people to have just one decent turn out. I guess the "organizers" know what they're doing. Just who are those amazing organizers anyway, who can schedule and coordinate 950 nationwide grass roots events and rallies, just like that! That's a LOT of work! How many people do they have working on this? We've never seen coordination like this for anti war protests or impeach bush demonstrations, and those are pretty darned critical things to millions of people. We could really use this kind of last minute kung fu coordination! Imagine knowing such amazing grass rooters who can whip out a thousand damned nationwide events overnight on five cents and a shoe string! Do you think these whiz kids could whip up a National Anti Iraq War day? Or a National Justice Day? Or a National Fair Wages Day? I've got a whole list of "Days" we could really salivate over!!! How on earth did they manage it? Who ARE these people and why aren't they making themselves available to us for other incredibly urgent citizens movements? Who' s doing this action day thing? Who's idea is it? What's the point of it? Who's paying for all of this? Who is calling Amy Goodman with no details whatsoever about it and getting her to relay this faceless, nameless, unsubstantiated "news"? Who knows? There are no details, all right? You don't need no stinking details anyway, okay? Just believe it and shut up or else. YOU don't need to know who the organizers and planners are. YOU don't need to know who footed the bill for all of this stuff. YOU don't need to know who or where or how anybody or anything in this story came about. It's a god damned secret all right?! Isn't all of this literally unsubstantiated "news" nothing more than blatant propaganda? A steaming pile of reeking bull doody? Is it really too much to ask to get some names and dates and organizational titles? Can we get some definitive data to check into these things? We got NO information at all about any of this stuff. Not a fricken detail about a single fricken thing. We can't check into any of it! The ONLY detail we got is the name of our dear, trusted, new friend, the "one of us" good guy, Al Gore. That's all we got. 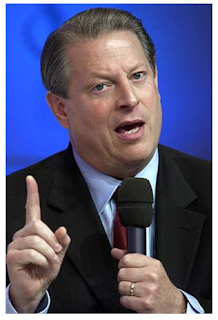 All of this citizen activity would sure lend a lot of credence to Gore's congressional visit wouldn't it? It needs some credence after all. Why would congress need Gore to testify on environmental issues? He's not a scientist. What kind of input could he give that is critically necessary to congress? Anyone listening to this little report would get the definite impression that people are everywhere all motivated and crying out for this "climate action" thing, which I've never even heard of until now. We'd think hundreds, even thousands of people are walking across their states, passing resolutions left and right, begging the government to get on board and to please tax us for more research dollars; and if you're not involved then you're just missing out on all of the for real and for true, honest, grass roots activism going on in this real and true, 100% honest "It's all your fault" global warming game. What's wrong with you?! It's the latest thing. Get on board! Hurry up! Believe it all! Believe every bit of it! It's just for sure true! Would we lie to you???? At least when Amy forces herself to read this cointelpro tripe to her public she does it without a hint of support or enthusiasm. She probably doesn't like having to do it. She always gets this little smirk on her face, especially when it's pro bush lies. But the bottom line is, she DOES do it. How much more of this kind of thing have we all swallowed without a clue? In this day and age it's just no longer possible to believe anything we hear on TV and we need to never forget that. Take it with a grain of salt, check the facts yourself and if nothing else, train yourself to notice obvious things like no details AT ALL. Because smart IS good.